I don't play a ton of FPS (first person shooter) games, but some of the reviews I was reading about Far Cry 3 sounded pretty interesting. Particularly I like games where there is a lot of progression and customization. In FC3, there are level-up and crafting systems. Plus the visuals are pretty amazing (again, not usually a reason why I buy games, though). Anyhow, found a little Japanese! 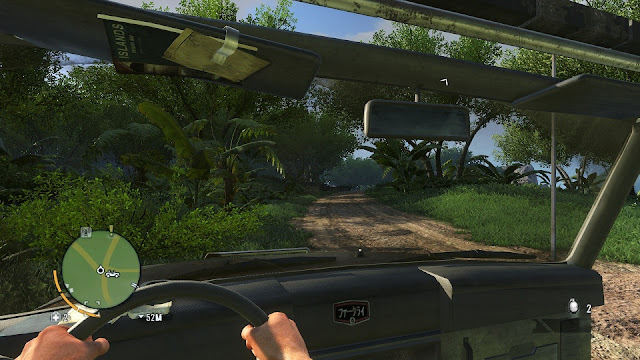 One of the cars is sporting some katakana on the dash, reading "Far Cry." Never know where it's gonna crop up, apparently. Lately there have been some pleasant changes. One of my best friends and his awesome (J) wife moved from Pennsylvania to a town about 40 minutes away. I've gotten used to being somewhat solitary, but it will be a nice change to have friends living nearby. And I've been talking a lot with someone I met recently who is very...refreshing? Special, for sure. There are a lot of positive things I could say, but for now I won't. I don't want to jump the gun on anything, but I just feel like things have been a lot brighter and more fun the past couple of weeks. Anyhow, that's it for now. Whoops - a sparse amount of posts this month, but there's been a lot going on. I'll need to redouble my efforts. Our December riddle asks "What vegetable goes up and down?" This one isn't so much tricky as demanding of your vocabulary skills. かぶ is the common pronunciation for both stock (as in the stock market, hence up and down) and the common turnip.